“If you build it, they will come.” It’s an oft-heard phrase, originating from a charming film about a baseball diamond created in the middle of an Iowa cornfield. In that case, “they” refers to not only the ghosts of baseball’s past, but also the current community as they gather together in celebration of something so inspiring, so beautiful, so at the core of America. 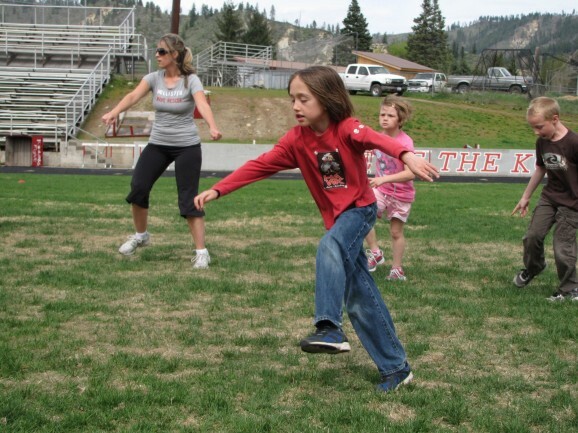 The Peshastin Dryden Striders in full motion during a recent practice. Guess what? The same idea applies to something happening at a particular spot in Peshastin, nestled between the elementary school and the river, tucked below Highway 2. That’s the home of the Cascade School District’s track. It was built years ago and is utilized by the Cascade High track team, the burgeoning Icicle River Middle School track team (50 strong) and other groups and individuals. The track also happens to be in the backyard of Peshastin Dryden Elementary. 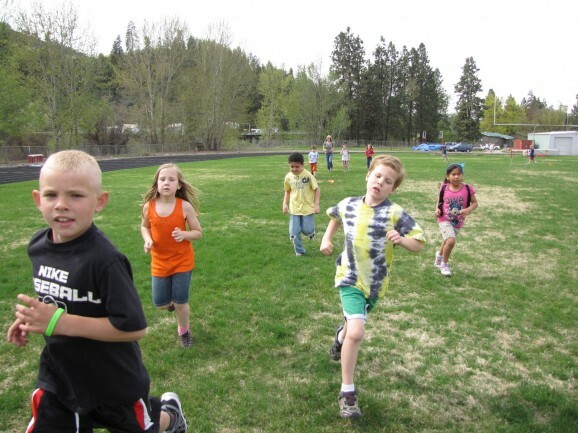 And despite its proximity, the kindergartners and first and second graders don’t have much of a history of touching foot on the track, except while preparing for and then participating in the annual Jogathon. Until now. Recall, “If you build it, they will come.” This time, the “it” refers not to the track itself, but the opportunity. In early March, Becki Heyl and I shared a vision of an after-school running club. We quickly hammered out initial details for the PD Striders, the general schedule and plan, snacks and volunteers. We received some funds from the generosity of the PD PIE (Parents in Education) Group. Then we sent out the permission forms and waited for the response. The response went from a trickle to a flood in one day. Our original and redefined cap was exceeded again, and again. We now have 90 enthusiastic athletes, ready to run! That’s 90 kids who are choosing, after a long day of school, to run with their friends, to warm up, do plyometrics (just like the big kids), run relays and fartleks and time trials. Their hearts are pumping, their legs get tired, they get hot and thirsty. These 6- to 8-year-olds are working but also learning that some work is fun. I watch them try their hardest and cheer each other’s efforts. I’m awed by each and every kid who dared to give the Striders a try. Some are into sports and running comes naturally. Others may shy away from ball sports or team sports but like the simplicity of running. 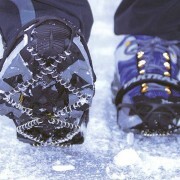 Some run in sneakers, others run in fancier shoes. Some play outside with their families every day. Others don’t have much exposure to the wonderful outdoor opportunities in the Upper Valley. Running is the great equalizer. We are made to run; it’s in our anatomy thanks to our ancestors’ capability at running down prey. And children are “in” their bodies and welcome movement, unlike grownups who tend to remove themselves from their bodies as they become more cerebral and social. The PD Striders get into the spirit of a little training. The PD Striders has received a wealth of volunteer support. This is a testament to the fact that parents, staff and other community members also want to get out and move, without worry of rules or special equipment or training. Just running together in the fresh air. What could be more simple or appealing? We hope the trend continues. Look out for the Striders. They’ll be the kids running, fast or slow, with a smile on their faces — guaranteed. 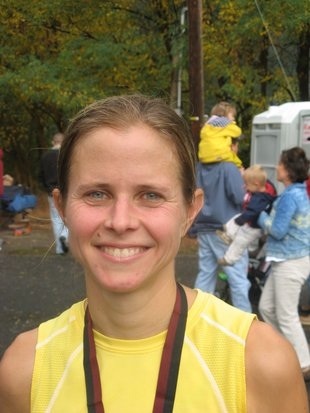 Marlene Farrell is a Leavenworth writer and long-distance runner who has qualified twice for the U.S. Olympic Marathon Trials. Great article! What an opportunity for kids to have fun being healthy! Thank you Marlene for your vision, preparation and time and energy! Wow, how great is this! Getting these kids moving at such an impressIonable age. 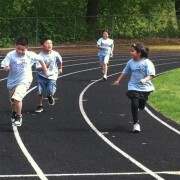 Marlene, you are a great runner, writer, and role model!